Masonry Saver (Defy) Water Repellent for Vertical Brick is a modified siloxane based product designed to penetrate deeply in to most masonry and concrete pores. This masonry waterproofing product allows deep penetration of its active ingredient of up to 1/4 inch or more. 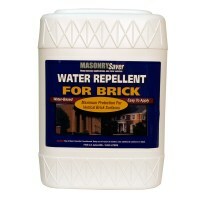 The special siloxanes in DEFY Water Repellent for Brick react to form strong chemical bonds beneath a treated surface. These bonds allow the product to become a physical part of the structure and provide long-lasting water repellent protection without altering the appearance of the brick. 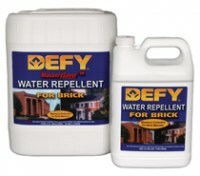 DEFY Water Repellent for Brick treatment is 100% vapor permeable, which allows the water moisture to escape. This reduces costly chimney repair such as spalling, scaling, deterioration, and freeze-thaw damage that results from trapped moisture when clear coatings and water sealers are used for waterproofing brick. Can product be applied with brush? No. Use a pump sprayer for applying. Very easy. We are looking for interior brick sealer that will allow a brick surface to meet health department requirements to close pores of the brick to make it cleanable. Will the Defy water repellent for brick fill pores in a brick surface? I am sorry but no it does not "fill" pores. how long does the brick have to dry after a major rain to apply the water repellant ? Also how long and how many coats does it have to have ? No it will not alter the appearance.